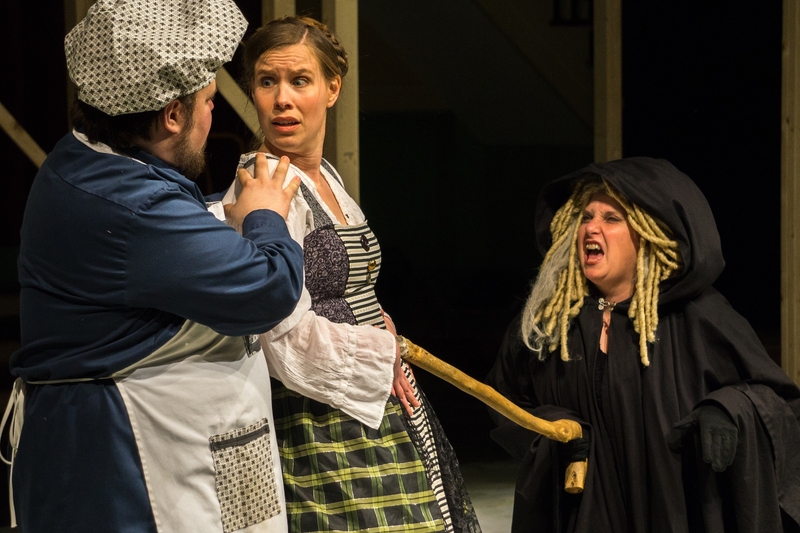 Stephen Sondheim’s Smash-Hit, Tony-Winning Musical INTO THE WOODS is onstage at Lost Nation Theater - the community’s professional theater – continuing the 2017 season at Montpelier City Hall Arts Center, Thursdays – Sundays, June 1– June 18. You know the saying, “Careful What You Wish For?” Into The Woods, the Tony-Award Winning Musical from one of the biggest Giants of Musical Theater the world over: Stephen Sondheim, grabs that idea and runs with it, resulting in one of the best-loved musicals of all time. The Daily News raved: “Total enchantment. A spell-bounding score, witty enough to make old stories fresh for adults, lovely enough to enchant youngsters." And now it’s at your community’s professional theater: Lost Nation Theater, in downtown Montpelier, June 1-18. Into the Woods is an epic fairytale adventure about wishes, family, and the choices we make. All your favorite stories collide and are never quite the same again! Cinderella, Jack & the Beanstalk, Rapunzel, Little Red Riding Hood are just a few of the tales that get the Sondheim Treatment! And of course, what fairytale story is complete without a Witch? The Book, by longtime Sondheim collaborator (and Tony-Winner) James Lapine also explores “What Happens After Happily-Ever-After”. A timeless and rare modern musical classic bringing together everyone’s favorite storybook characters for laughter, poignancy, a little reality check, and enchantment. Tim Tavcar, a theater-music artist whose career has taken him across the country several times over to work at such esteemed venues as The Kennedy Center and Carnegie Hall, is back for his 20th Season at LNT. He is the company’s “Go-to-Sondheim-Guy”. Tim’s previously directed A Little Night Music and Sweeney Todd (among many others) for LNT. Into The Woods reunites Tavcar with musical director Lisa Jablow. Lisa holds a Doctorate in choral conducting and her credits include NYC Opera, Tanglewood, Vermont Contemporary Music Ensemble, and Assistant conductor for the Vermont Philharmonic in addition to her work at LNT. Choreographing is none other than Taryn Noelle of LNT’s Hairspray. Mark Evancho (LNT’s Red, Always Patsy Cline, Arms & the Man) returns to once again to create magical Sets & Lights. Emily Reynolds is creating gorgeous, fanciful Costumes with a touch of edge, and Will Davis shapes a mysterious world through his Sound Design. Favorite LNT veterans take the stage alongside those making their LNT Debut. The cast includes Rick Ames (Hairspray), Aaron Aubrey (Complete Works of Shakespeare-Abridged), Allison Devery, Kathleen Keenan (Patsy Cline), Veronica López, Jake Minter, Karli Robertson, Bill Pelton (Sweeney Todd), Miranda Scott, and Carolyn Wesley (Lyddie). Join Us!! Curtain is: 7:30pm Thu, Fri & Sat; 2pm Sat & Sun Tickets are: $35 Fri & Sat Evening; $25 Thu and Matinees. Opening Night Masquerade Gala Friday, June 2 with a pre-show reception catered by NECI: $60 all inclusive and starts at 6:30pm. Special tickets Preview Thu June 1 and Saturday Matinee June 3: $15. Students & seniors (age 65): $5 Off. Lost Nation Theater is wheelchair accessible, and offers an assisted listening system. Call! CLICK HERE! Or get tickets at the City Clerk’s Office on the first floor of Montpelier City Hall. You can also take a chance on getting tickets at the door! (1 hour before curtain).